The MKP 300-250-315 can transfer hazardous media at higher flow rates. Swiss pump manufacturer CP Pumpen has launched a new pump size in its MKP product range of seal-less magnetic drive pumps. CP Pumpen produces zero leakage magnetic drive pumps for handling difficult media and the new pump size makes it possible to transfer hazardous media at higher flow rates. The MKP 300-250-315 provides flow rates up to 1200 m3/h with differential heads of up to 50 m.
CP’s seal-less magnetic drive pumps are designed for hazardous and aggressive media as they are leak-free and can also hand media which contains solids. This new MKP pump size 300-250-315 provides all the same capabilities but this size also has a small number of components within an intelligent modular system which simplifies assembly and lowers costs for spare parts, maintenance and service. 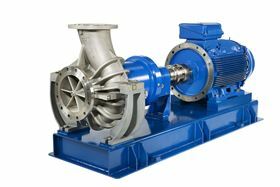 The pump is available with different options and monitoring capabilities. The company says that its seal-less pumps are continuously being improved and it offers pumps for the chemical, pharmaceutical, biotechnology, food and beverage, pulp and paper industries.